I watched the sequel not really sure if I’d seen the first one. As the movie started to play, bits and pieces of the story started to sound familiar; albeit, four years is a long time and I have probably seen hundreds of movies since the original Taken was released back in 2008. Don’t get me wrong. 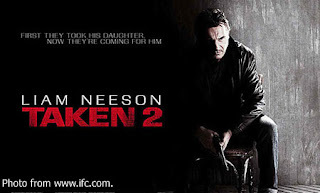 I found Taken 2 quite excellent as an action movie. The plot is simple enough to grasp and told in a straightforward manner unlike – say – ‘The Bourne Legacy,’ the numerous flashbacks of which can be confusing. The movie raises no undue complications and everyone goes home happy that all the bad guys have been slain. Formulaic, perhaps; but a quick check with IMDB shows that it’s a profitable formula. Taken 2 sits atop the box office top grossers’ list. Liam Neeson reprises his role as the retired CIA agent who invites his ex-wife Lenore (played by Famke Jannsen) and daughter Kim (played by Maggie Grace) to join him in Turkey where he has some business to attend to. Bryan and Lenore soon find themselves abducted by a renegade Albanian group out to avenge relatives killed by Bryan in the first movie. While in the custody of the Albanians, Bryan extracts a Bond-ish cell phone from his pants and calls his daughter to warn her that she is also in danger. Instead of seeking refuge at the United States Embassy as advised, she becomes her father’s tool for extracting himself and his ex-wife from their predicament. I will stop with the storytelling here; else I spoil the fun for those who have yet to see the movie. The pacing of the movie is electric and none of the fight scenes, except for the last one, are belaboured. A hand chop here; a knife slash there; and a bullet fired here and there – Bryan quickly and efficiently fells the Albanians one by one. How he avoids being hit by bullets flying all around you console yourself with the fact that he is the movie’s main character and that that the movie gets abbreviated if he gets killed. So you happily watch knowing he will survive. What action movie is ever complete without car chase scenes; and what is it about Hollywood productions that audiences get sucked right into car chases like they are themselves sitting in the passenger seats? Taken 2’s car chase scenes are no different and are probably more fascinating as they take the audience along narrow and winding medieval cobblestone alleys. Now naturally, upon getting home, top of my priority list was to seek out my movie collection. As I suspected, I do indeed have a copy of Taken. So, I naturally put it on if just to fill myself in on Taken 2’s references to the first movie that I could not in the cinema quite recall. Oh well! What can I say? If you just recently watched Taken, you will probably feel short-changed if you watch the sequel so soon after. It’s the exact same story with the roles reversed in a different setting. In Taken, Kim was the one abducted in Paris by the Albanian underworld and sold into prostitution. Bryan, being the loving and dutiful father, goes after her trail to liberate her. 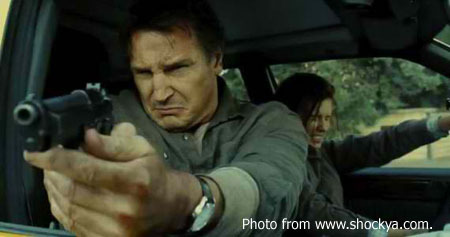 In so doing, he does the chop-fire-dodge-bullet routine, participates in a car chase and fights hand-to-hand combat as the movie draws to a close – exactly as he does in Taken 2. As a strategy for making money, one has to applaud these Hollywood moguls. Wait four years for people to forget the story; tweak the plot here and there; shoot in a different location; make more millions.